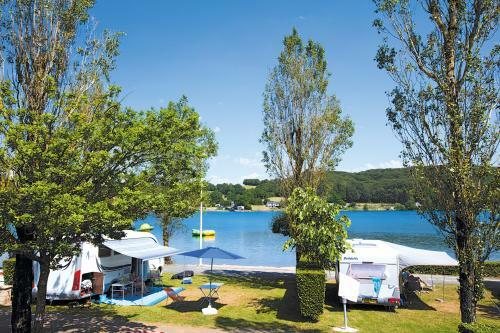 If you are looking for a relaxing holiday in the Aveyron, we offer wonderfull lakeside pitches. Spacious, they offer you a private grassed plot of 80 to 100 m2 facing the water: the ideal spot for setting up camp with tents, caravans or camper vans whilst still maintaining a large space for relaxation. You’ll have ample space for garden fairs, deck chairs and beach towels. The kids will also have a beautiful space to play games in. These pitches are not overlooked: In front of you the lake, its atmosphere and its changing colors over the hours: enjoy the morning calm, its events throughout the day that you never tire of watching or even the luminosity which plunges into the setting sun. Perfectly situated along the beach, these pitches allow you to enjoy the joys of swimming and idleness without having to move more than a few meters. These lakeside comfort pitches come with a 6-amp electric hook up point included in the package, which can even be upgraded to 10-amp if necessary. This ideal location also features a drinking water tap which you can connect to waste water disposal facilities. The plots are defined by their hedges and trees which provide you with peace, tranquility and privacy during your stay in Aveyron. And because happiness is about sharing, dogs are welcome on both the pitches and the beach. The simple path which goes between the campsite and the beach is a great place for an evening stroll, when the lake’s waters empty and nature takes over. Ideal for fishermen, the lakeside comfort pitch allows enthusiasts to spend the day trying out different fishing techniques: from the pontoon or the bank only a few meters away or from a boat that you can launch from the beach.